When it comes to fixing an ill-fitting garment, there’s a few small but effective alterations that I rely on time after time! Being familiar with alteration types can also really expand your options while shopping, especially if you’re petite but don’t want to be limited to the petites department. I wanted to illustrate two of my go-to alteration types today – these two are unrelated, but this dress served as a good example for both! Although I loved the print on this dress, it was best suited for someone taller because the armholes and neckline were a bit gaping and low on me. The straighter-cut bottom also felt a little shapeless on me. Thankfully since it’s simply made and unlined, it took only me about 15 minutes to alter! 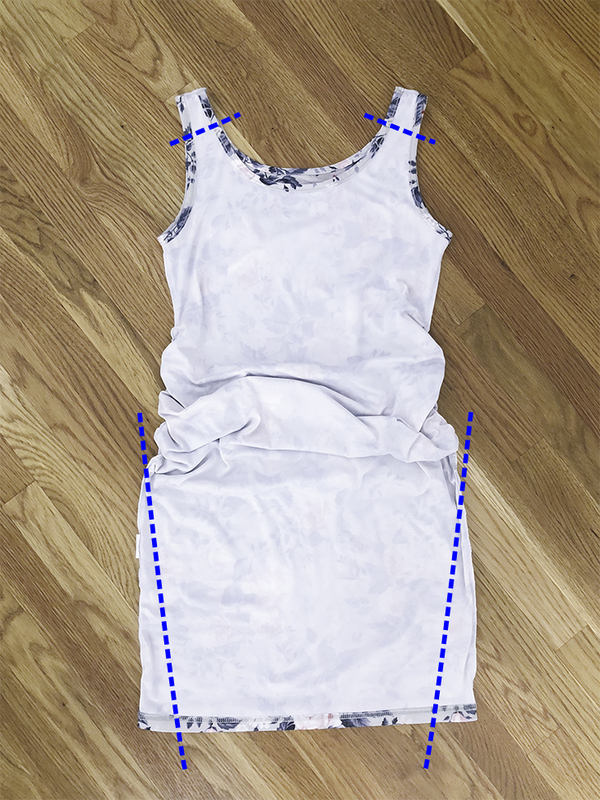 Shortening the shoulder straps on a dress or top. Why I love this: Aside from the obvious of making shoulder straps shorter, this is one of my favorite alterations since it can fix a number of issues in one fell swoop! I use it often to make regular-sized pieces more flattering on a petite frame. For example, take a dress where the A) neckline is too low cut, B) armholes are too big and low (thus revealing your bra), C) waistline sits too low, and D) length is too long overall. By simply shortening the shoulder straps, everything gets shifted upwards and each of these problems gets addressed. Tapering in the bottom hem on a dress or skirt. Why I love this: This is personal preference, but dresses and skirts that are straight-cut on the bottom just don’t do anything for my already straight-cut body type. For this reason, I either go for fitted pencil or flared A-line bottoms for a more defined silhouette. I would not recommend dramatically changing the shape of a garment (ie. don’t buy a flared skirt hoping to alter it into a pencil), but I often taper in my straighter skirts just an inch or two to create a more shapely silhouette. If the garment in question is lined, structured, or on the pricier side, I’ll have my tailor do the alterations professionally. But if it’s a basic unlined item like this dress, I’ll just do it myself (this is a good entry-level sewing machine, if you’re looking for one). As I always disclaim, my DIY alteration posts are not the most proper methods, but they’re quick and they work for me! 1) Wash and dry the garment before altering, in case it shrinks. 2) Turn the garment inside-out and try it on. 3) Use fabric chalk to mark how much you want to take in. For alteration type #1 (raising the shoulder straps), I usually use a binder clip to test out different strap lengths on me before marking it. For alteration type #2 (tapering in the hem), I do the same, making sure to leave enough wiggle room to walk in a comfy stride and go up the stairs! 4) Take the garment off and lay it flat, still inside-out. Pin along your markings, then sew in a straight stitch (I sewed along the dotted blue lines shown above). Turn it rightside-out and try it on for fit. 5) Optional: If the excess fabric feels bulky, trim it off about 1 cm beyond your alteration stitches. If you don’t have a serger for raw edges, you can use the zig zag stitch on your sewing machine to help seal off the cut edges and minimize fraying. You are so cute pregnant and this dress looks so nice on you! I love your alteration tips and have always done the same since I am similar to your size. I feel like I always have to alter my dresses. I definitely do the shoulder straps. I love a good tapered skirt/dress too, but I’m always afraid to do it myself. Love ♥️the simple alterations … it really does make the dress look twice as desirable . A wonderful job well done. Thank-you for sharing this Jean, that’s so interesting! I’m absolutely terrible at alterations, but I’d love to learn! I hope you’re having a wonderful Wednesday! I am the same exact size as you and I always run into the same problems! Particularly with the shoulder straps being too long (on almost everything). I wish that I had sewing skills so I could alter things myself, but I typically just take them to a tailor. This dress is adorable! Just curious–have you found yourself having to buy a lot of new clothes while pregnant? 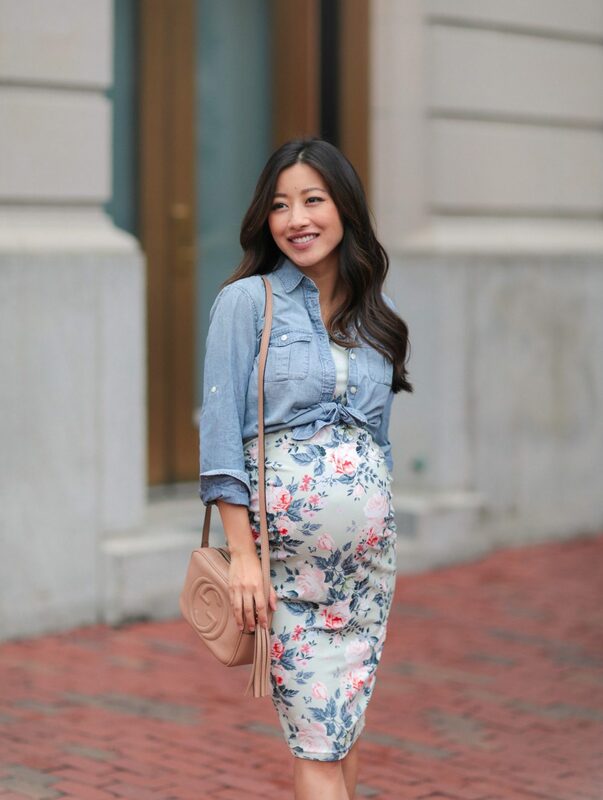 I am not expecting, but always think about the day I do get pregnant because I feel like nothing of mine will fit since I am so tiny and wear my clothes more form fitting (since you know when you are petite it looks frumpy if things are baggy!). Hi Elizabeth! I’m so grateful for my tailor. Even though I can get by doing some alterations myself, the handiwork still pales in comparison to a good tailor’s. As for day-to-day clothes, I did not buy much while pregnant and cycled through the same few stretchy dresses (paired with my older cardigans + jackets) on repeat. You just need a handful of comfortable pieces that stretch a lot at the belly, and bonus if they are black or something subtle so people won’t notice or mind the outfit repeating ; ) I did buy a number of special occasion dresses for maternity just because I wanted to do special photoshoots like for our anniversary, shower, and maternity sessions but that’s definitely not necessary. It makes a huge difference! You’re so talented! Hi Jean, thank you for this helpful post! I had two questions – I do the same type of alteration with the straps though I don’t have a sewing machine so I hand sew. Do you have any pointers with the hand-sewing? I’m definitely not a good tailor, but I try to make my stitches as even as possible. The other question is the arm holes. Sometimes I worry that the arm holes will become too high if I raise the dress – should I be worried about it being too high? Thank you! Hi there – unfortunately I am very bad at hand sewing (my stitches were always uneven) so I only do simple machine sewing. I’m sorry I can’t help much there! Regarding the armholes, yes if you take up too much of the shoulder straps, the armholes could get uncomfortable and dig into your armpit. But if you try the item on and clip it / pin it to test it out, you should be able to find the optimal amount to alter! Good tips here. Thanks for sharing. this looks so amazing!! I wish I could sew to learn how to do all of this myself! Thank you so much for this. I am a basic sewer, but have always been scared to try altering clothing myself. How do you alter spaghetti straps? Would you do the strap where it meets the shirt in the back? Thanks for this great post. I had given up sewing for several years because my machine had stopped doing most jobs and I thought a new one would be way too expensive. Then I found this one “Brother CS6000i Feature-Rich Sewing Machine 60 Built-In Stitches, 7 styles 1-Step Auto-Size Buttonholes, Quilting Table Hard Cover” for under $150 on Amazon. I have already altered 5 garments and have plans for more. I love these two simple alterations and how you can give directions on how to do them yourself. I am always having to adjust the straps on my clothes because I have broad shoulder. This means I usually have to go a size up and then just try and make the whole outfit work. When it comes to taking in the bottoms of my clothes, especially dresses or shirts, I am always very nervous because I feel if you go to tight or short then it ruins the whole thing. That you for your insightful advice. How timely this post is! I just bought a simple black inexpensive cotton sleeveless dress to take on my beach vacation. H and M did not have an extra small so I bought the small intending to alter the shoulders and hem it. I have not heard of tapering the sides, but now I am definitely going to try this. From the looks of the picture you begin the tapering at the hips not the waist. Correct? I am hemming the dress to just above the knee. I assume this would work with this hemline as well. Thanks. Hey Jean! I’m around your height (4’11), but a lot heavier (still trying to lose the baby weight) and it’s difficult for me to find leggings that fit me perfectly. They always get baggy and don’t fit right around the knee area especially. I see a lot of people talk about Zella leggings and LuLu Lemon. Which would you suggest for petite people? I have to take the shoulder straps in on a lot of dresses, but one issue I sometimes face is that when I bring the shoulder strap down to meet my shoulder, it can bring the arm hole up too high and make it a bit tight. Have you ever had this happen? How do you balance shortening the shoulders with keeping the arm holes the right size? Lovely way of breaking down simple alterations that make a difference! If you’re working with knits or a stretchy material, try using a narrow zig zag stitch. That’ll create give in the seam so it doesn’t pop. That’s what sewing patterns suggest for people who don’t have sergers, and it’s worked well on every stretchy material I’ve used it with. The more give a seam needs (like the knees of leggings) the wider you want the zig zag to be. 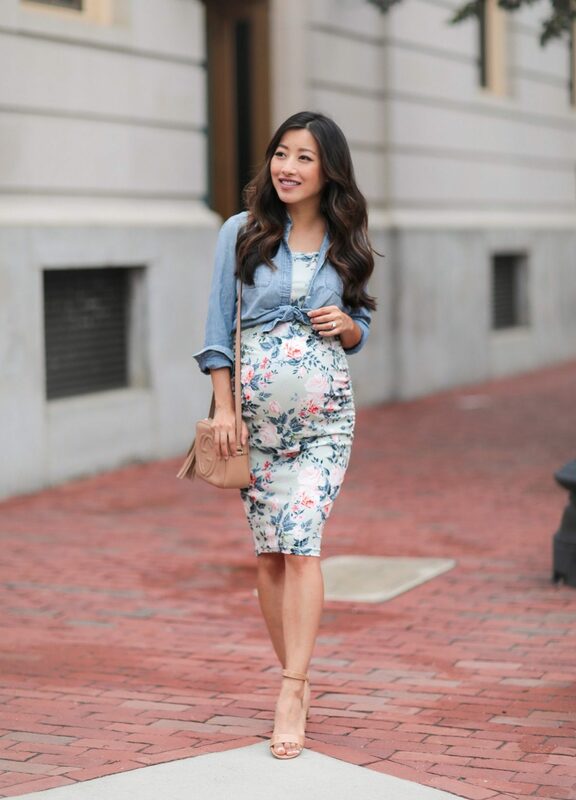 Would you be able to categorize all your maternity posts under one category in Lifestyle? I would love to see all the maternity wears but I have to scroll back the posts to see them. Thank you! Hi Jean, I tried to taper as above, and ended up with “pooching” outwards at the start of the tapering. Do you know how to fix that? Also, do you literally taper in a straight line or curved (I can’t remember what I did). Any tips / advice re: tapering would be very helpful. Thank you! !